Adorable. Jonah loves the water also. I do use a jacket for him in pool even now at 5 yrs. old. He does not go in by himself he will wait for jacket which is good that way I do not have the fear of drowning. You look so cute Lilly. Sitting there like a really big girl. It sure is a great way to beat the summer heat here in fl. 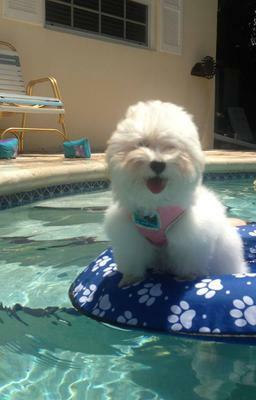 My little girl Cotton loves the pool but her sissy sure does not....Love your pic! What a great picture, I just want to kiss her! Lily is a doll baby. What a pretty face. Don't get sunburned!